Flika means young lady in Swedish. It is a really special Folckboat model, for unlike the other yachts of its class, Flika is one of the few that is not built on clinker, but with normal strakes, which furthermore, have the same length as the boat does. The Folckboat was born as a cruise as a result of an official contest in Sweden. It has also been used for large voyages, thanks to its proverbial stability, due to the fact that more than the half of the displacement is on the keel’s ballast. Soma yachts have circumnavigated the globe. 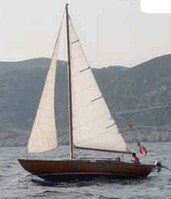 Others, as the famous “Jester” which had a curious red ribs, has participated in all the solitary transatlantic regattas that his owner was able to race. But even the Flika moved form Sweden to Spain that was by truck. Modestly it keeps on going with its quiet cruise navigations and some occasional regatta, sailing closely to the coastline.